Whoa. I have to say that I think this bar sounds great! I love the idea of a blood orange flavored candy and I think the “tart Creamsicle” description really sold me. This Blood Orange Yogurt Chocolate is OUT OF CONTROL GOOD!! I just returned from Frankfurt and bought a few at the airport…cannot believe how delicious they are. They are currently sold out on the http://www.germandeli.com website, and I couldn’t find this flavor on the Ritter-sport.com website, but hope to order some to send to family. I think the yoghurt refers to the filling. the chocolate itself should be white chocolate at least. the white chocolate/yoghurt stuff is sold only in summer (it’s supposed to be “light, fruity” summerchocolate, so you can’t get them in winter). yoghurt chocolate is popular in germany, usually it comes as dark chocolate with a yoghurt filling. it’s by no means low-fat candy btw – as far as I know, yoghurt chocolate has even more calories than ordinary milk chocolate. 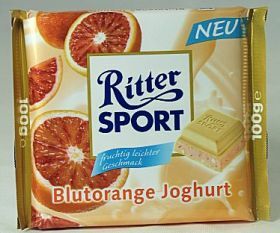 I tried the bloodorange Ritter Sport when I was in Germany. I thought it was good, but not the best thing Ritter Sport has made. I would kill for the Marzipan and Ganzemandel (whole almond) varieties. Marzipan Ritter Sports are now available at almost any grocery store now and even Target sells them (Target has the cheapest ones I’ve found in the states). I haven’t seen Ganzemandel anywhere here. They put Hershey almond bars to shame! Other varieties I’ve tried: Cocos (coconut)- VERY rich, it’s not like an almondjoy, the coconut filling is a thick cream. I couldn’t finish this chocolate bar in one sitting. Traubennuss (raisin hazelnut): I wasn’t a big fan, it is rum flavored and I don’t really like rum chocolate. Alpenmilsch (alpine milk chocolate)- a little bland, but alpine milk chocolate is supposed to be that way. I just have a preference for darker varieties. When I was in Germany, there was also a white chocolate blood orange Kit Kat for sale. I actually found Ritter Sport to be the cheapest at Trader Joe’s, selling for $1.49 per 100 grams (about 40 cents cheaper than that in Target). The only problem is that Trader Joe’s does not have a big selection of flavors. I literally live on chocolate and my day doesn’t work out unless I eat real chocolate (Hersheys, ugh!). Thanks to Ritter Sport, I am mesmerized daily by the smooth, creamy, extravagantly delicious chocolate in a resealable package. YUM! Interesting how you found the Marzipan flavor to be your favorite; that one is least appealing to me. It strays from the taste of other Ritter Sport chocolates.